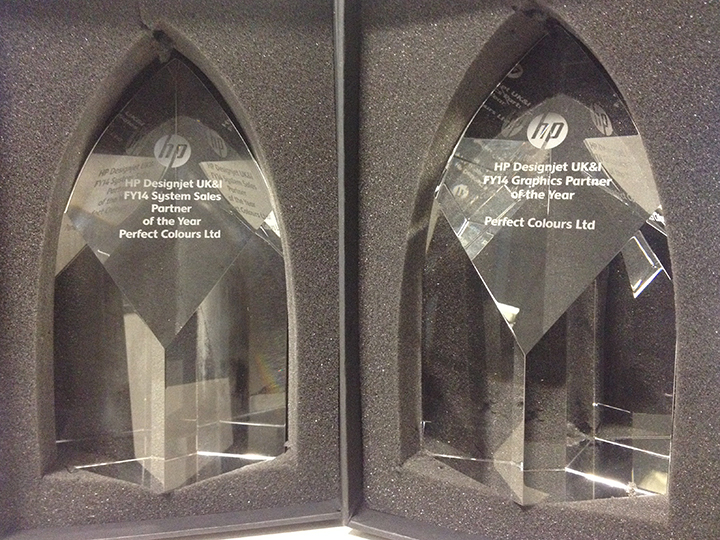 Perfect Colours have won a number of awards from HP for their fantastic performance during HP’s 2014 Financial Year. One award titled "Graphics Partner of The Year" was for the best sales of HP Designjet graphics products and the other "System Sales Partner of the Year" was awarded to the partner who demonstrates the best sales of Hewlett Packard, Ink, media and carepack products. Perfect Colours also won a bottle of champaign for winning one of the biggest deals of the year. Winning these awards is a fantastic achievement for Perfect Colours, I want to thank everyone for their efforts in helping us winning these prestigious awards; and look forward to working closely with HP to develop the UK’s Large Format Print Market.